It is not strange that easily win a battle in the ambush battle. Almost all great victory in the history was effort by a good ambush battle, now with the new version of COK, we bring this brand new battle system to you. 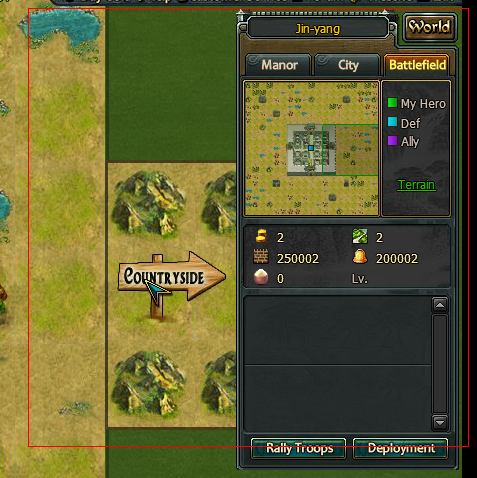 In this new version, players can deploy your troops to the countryside, and only the Rank 8 and 9 players can move the troops in the countryside. 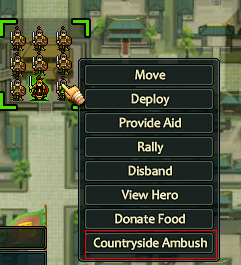 When the enemy attack your city, they will encounter the ambushed troops which hide in the countryside firstly, instead the troops in the city. 1. When attackers reach the city, the system will judges that the countryside of the city have ambushes or not, also the system will calculate the amount of these troops and judges that whether the amount of ambushes is more than the attackers. If the countryside is not in the battle or the ambushes is more than the attackers ,then the troops of attackers will into the countryside battlefield. Until the troops of attackers is more than or equal to the troops of ambushed, the battle will be end. 2. When the allied troops reach the city, then they will enter the city battlefield directly(not the countryside battlefield). If the enemy troops reach the city, then they will be intercepted by the ambushes of your kingdoms. And the enemy cannot deploy their army to the countryside directly, the city will be the only target when they deploy their troops. When countryside battle is end, the victorious kingdom will occupy the countryside battlefield. And if there are no ambushes in the countryside battlefield, then the attacker will occupy the countryside battlefield by default. If the battle cannot finish in 100 round, then the troops of attacker will be sent to the city they deployed from.